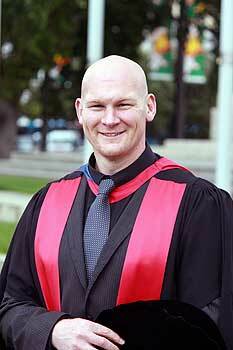 School of Sport and Exercise lecturer Dr Matt Barnes graduated with a PhD in Palmerston North last month. His research builds on work he did as an honours student that found alcohol inhibits recovery from injury. He carried out several more studies to further investigate the link between alcohol and muscle recovery. In one study, participants carried out intense exercise that damaged a muscle. Participants then consumed alcohol, at a dose equivalent to seven standard drinks for an average male. On another occasion the same damage was done, however orange juice was consumed instead of alcohol. The strength of the damaged muscle was then tested over the next three days for any loss in force. Dr Barnes says it was clear that drinking alcohol slowed recovery compared to orange juice. This could be linked to an increased feeling of pain, but more research is required to prove this, he says.